In a certain village there lived Ioi and her younger brother, Bluejay. One night the ghosts went out to buy a wife. They bought Ioi. The presents that they gave for her were not sent back; they were kept. So at night she was mar­ried, and when day came, Ioi was gone from her father's house. For a long time Bluejay did nothing; but at length he felt lonely, and after a year had passed he said, "I am going to look for my elder sister." He started for the country of the ghosts, and on his way he began to ask every one whom he saw, "Where does a person go when he dies?" He asked all the trees, but they could not tell him He asked all the birds, but they could not tell him. At last he asked a Wedge, and the Wedge said, "If you will pay me, I will carry you there." He paid, and the Wedge carried him to the coun­try of the ghosts. They came to a large village, but no smoke rose from the houses; only from the last house — a big one — they saw smoke rising. Bluejay went into this house, and there he saw his elder sister. She said to him, "Ah, my younger brother, where do you come from? Are you dead?" He answered, "No, I am not dead; the Wedge brought me here on its back." After a little, Bluejay went out and walked through the village, and began to open the doors of the houses and to look into them; and when he looked into them he did not find people in any of the houses, but only bones. Then he came back to where his elder sister was. On the bed near where his sister was sitting lay a skull and some bones. He asked her, "What are you going to do with that skull and those bones?" She said to him, "That is my husband, your brother-in-law." 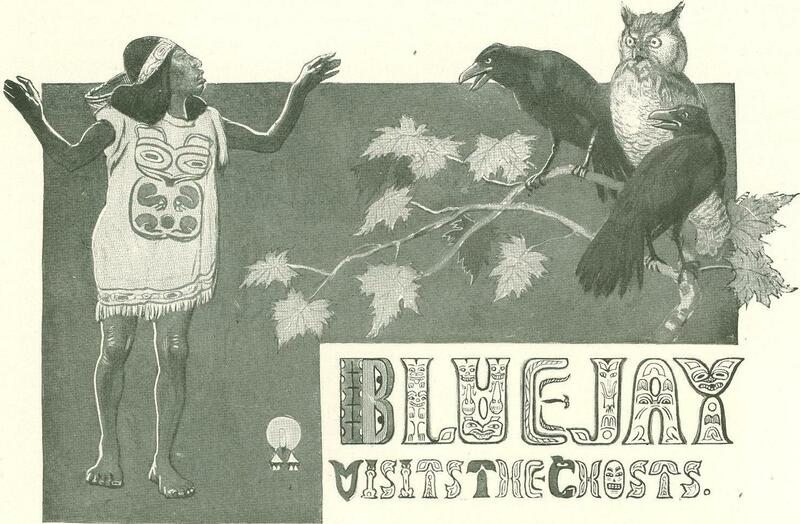 Bluejay did not believe her; he said to himself: "Ioi is telling lies. She says a skull is my brother-in-law!" When it got dark people began to ap­pear, and soon the house was full. It was a large house, but there were many people in it. Bluejay said to his elder sister, "Where have all these people come from?" She answered him: "Do you think that they are people? They are ghosts. They are ghosts." Now these people always spoke in whispers, and Bluejay could not hear what they said, and did not understand them. He stayed a long time with his elder sister. One day she said to him: "Why do you not do as they do? Go fishing with them, with your dip-net." He said, "I will do so." When it got dark he made ready to go, and a boy also made ready. His sister said: "This is your brother-in-law's relation. You two had better go together. Do not speak much to him. Keep silent." They put their canoe in the water and started, and as they were paddling down the river they saw ahead of them some people, also going down the river in a canoe and singing. When they had almost over­taken them Bluejay began to sing too, joining in their song, and at once the people were silent. He looked back at the boy in the stern of the canoe, but now there was no boy there, only a pile of bones. The noise Bluejay made caused the boy to disappear, and only bones were left. Now, as they floated down the stream, Bluejay sat silent, and was wondering what all this meant, and pretty soon when he looked back at the stern of the canoe the boy was sitting them there again. Bluejay said to him, speak­ing slowly and in a low voice, "Where is your fishing-fence?" The boy answered, "It is beyond here, down the stream." They went on farther; then Bluejay said out loud and suddenly, "Where is your fishing-fence?" 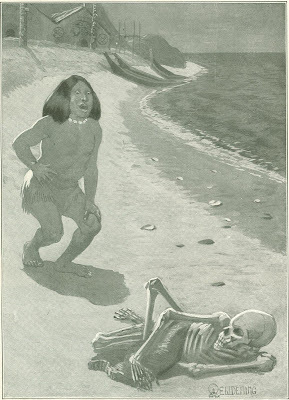 Only bones were in the stern of the canoe. Again Bluejay was on silent, and when he next looked back the boy was again in the canoe. Bluejay ­again spoke to him in low tones, and said: "Where is your fishing-fence?" The boy answered, "Here." Now they began to fish, Bluejay using the dip-net, while the boy held the canoe. Soon Bluejay felt something in his net and raised it, but only two dead branches were in it. He threw them out, and again put his net into the water. Again he felt something in it and raised it and it was full of leaves. He threw them out, but a part of the leaves fell in the canoe, and the boy gathered them up. Again he caught a branch and threw it out into the water; again he caught some, leaves and threw them out, but a part of them fell in the canoe. The boy gathered them up. Again he caught two branches both large ones. He was pleased with these branches, and said to himself, "I will take these back to Ioi; she can use them to build her fire." At length they shout­ turned back and went homeward and reached the village. Bluejay was angry because he had caught nothing. When they went up from the beach to the houses the boy was carrying a mat full of trout. After the trout were roast­ed and the people were eating them, the boy talked a great deal, saying: "He threw out of the canoe all that he had caught. If he had not thrown it away, our canoe would have been almost full." His elder sister said to Bluejay, "Why did you throw away what you had caught?" "I threw away what I caught because they were only branches," said Bluejay. His sister said: "Do you think they were branches? That is people food. When you caught leaves, those were trout. When you caught branches, those were fall salmon." Bluejay did not believe this. He said to her: "I brought home to you two branches. You can use them to make your fire." His sister went to the beach and found two fall salmon in the canoe: She took up to the house and went in, carrying them in her hand. Bluejay said to her, "Where did you steal those fall salmon, Ioi?" She answered, "These are what you caught." Bluejay thought to himself, "Ioi, keeps telling lies to me all the time." When day came Bluejay went down to the water's edge, to the beach. There on the beach were the canoes of the ghosts. They were old and full of holes, and partly grown over with moss. He went up to the house and said to his sister, "How bad your husband's canoes are, Ioi." She answered: "After this keep quiet, or people will get tired of you." But he re­peated, "The canoes of these people are full of holes." She said to him, angrily: "People? People? They are ghosts." When it again grew dark Bluejay again made himself ready, and the boy got ready, and they went fishing. Now Bluejay teased that boy. As they were going along he shouted, and only bones were in the canoe. He did this several times, but at last they reached the fishing place and began to fish with the dip-net. Now Bluejay took into the canoe all the branches that he caught, and all the —leaves, and when the tide began to fall their canoe was full, and they started homeward. 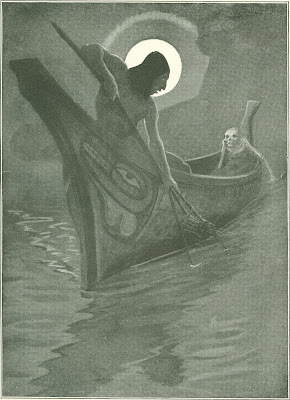 Now he began to tease ghosts, and when they met one he shouted, and only bones were in the canoe. At last they reached home, and he carried up to his sister's house part of what he had caught. She also carried up a part—salmon of two kinds. The next morning when it became day he went through the village again, and he found many bones in those houses. It got dark, and someone said, "A whale has been found." His elder sister gave him a knife, and said to him, "Quick, run! A whale has been found." Then Bluejay ran fast; and when he reached the beach he met some of those people. He called out to them in a loud voice, asking them, "Where is this whale?" Only bones lay where the people had stood. He kicked the skulls out of the way and ran on a long distance, and met some other people. Again he called out loudly to them; only bones lay there. He did this several times. At last he came to a big log, thrown up on the beach—a big log with thick bark—and many people were at work peeling off that bark. Bluejay shouted. Only bones lay there. That bark was full of pitch, and Bluejay began to peel it off. He peeled off two pieces and put them on his shoulder and went home. As he was going along he said to himself, "I thought it was really a whale, but it is only a fir-tree." He kept on, and at last he reached the house. Outside the door he threw down the bark and went in. He said to his elder sister, "I thought it was really a whale, but you see it is only bark." His elder sister said to him: "It is whale, it is whale. Do you think it is bark?"' She went outside, and there two cuts of whale meat lay on the ground. Ioi said, "It is a good whale; its blubber is very thick." Bluejay looked at it. Now he believed that a whale lay on the beach. He turned back and met a person who was carrying bark on his back. Bluejay shouted, and only bones lay there. He took the piece of bark and put it on his shoulder and carried it home. In this way he treated all these ghosts, and after a while he had a great deal of whale meat. Bluejay continued to live there. One day he went into a house in the village and took a child's skull and put it on the bones of a grown-up person. He took the large skull and put it on the child's bones. Thus he did to all these people. When night came the child sat up, in­tending to rise to its feet, but it fell over. Its head was so heavy that it threw it down. The old man got up. His head was light. The next morning when it became day he changed these heads back again. Sometimes he changed the legs of the ghosts, so that he gave small legs to an old man and large legs to a child. Sometimes he gave a man's legs to a wo­man, and a woman's legs to a man. After a time the ghosts began to dislike him. Ioi's husband said to her: "These people dislike Bluejay because he treats them in this way. It will be good for you to tell him to go away to his home, for now people do not like him." Ioi tried to stop her younger brother, but he would not listen to her. Now again when it became day Bluejay arose early. Ioi had in her arms a skull. Bluejay threw it away, saying, "Why does she hold that skull in her arms?" She said to him, "Ah! You have broken your brother-in-law's neck." It became night, and his brother-in-law was sick. His relations tried to cure him, and pretty soon the brother-in-law got well. Now Bluejay started to go to his home. But as he was going home he got caught in a fire, and was burned and died. Then he started back for the country of the ghosts. When he came to the river he called out to his elder sister, and she said,"Ah, my brother is dead." She put her canoe into the water and went across the river to fetch him. When she reached him he said to her, "Your canoe is pretty, Ioi." She said to him, "You used to say that canoe was grown over with moss." Bluejay thought to himself: "Ioi is always telling lies to me. The other canoes had holes and were moss-covered." She said to him, "You are dead now; that makes the difference." Bluejay thought, "Ioi keeps telling lies to me." Soon she carried him to the other side of the river, and he saw the people. They were playing games—dice and the ring game — and dancing — tum, tum, turn, tum and singing. Bluejay wanted to go to these singers. He tried to sing and to call out loud, but they laughed at him. Then he went into his brother-in-law's house. There sat a chief, a good-looking man; it was Ioi's husband. Ioi said, "And you broke his neck." Bluejay thought, "Ioi keeps telling me lies." "Where did these canoes come from? They are pretty." Ioi answered, "And you said they were moss-grown." Blue-jay thought: "Ioi is always telling lies. The others were full of holes, and were partly overgrown with moss." "You are dead now," said his sister; "that makes the difference." Then Bluejay gave it up and became quiet. 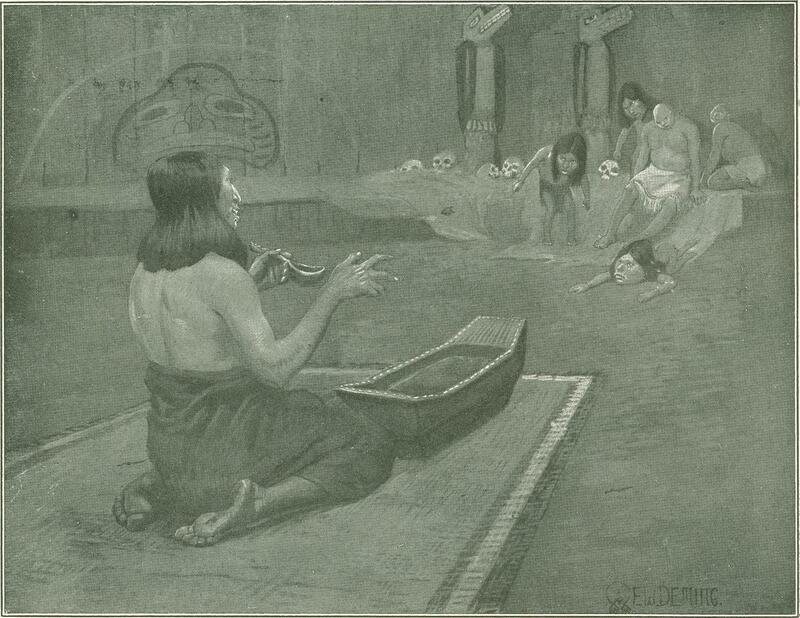 From Harper’s Magazine – November 1900.